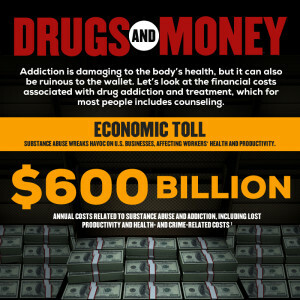 Drug addiction ravages the health of the body and mind, but it can also be ruinous to the wallet. Let’s look at the financial costs associated with drug addiction and treatment, which for most people includes counseling. Substance abuse wreaks havoc on U.S. businesses, affecting workers’ health and productivity. That’s more than $1,800 for every man, woman and child in the U.S. In addition to the costs to the economy at large, drug addiction is expensive on its own. How much does a typical drug habit cost? Drug addiction is expensive, but, unfortunately for most addicts, so is treatment. What are those costs and how do they compare with alternative outcomes, like jail?